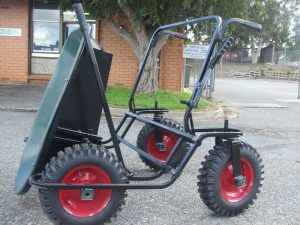 All terrain four wheeled wheelbarrow - TADSA - Technology for Ageing and Disability (SA) Inc.
Our client, Peter, has a spinal cord injury which has adversely affected his right limbs. 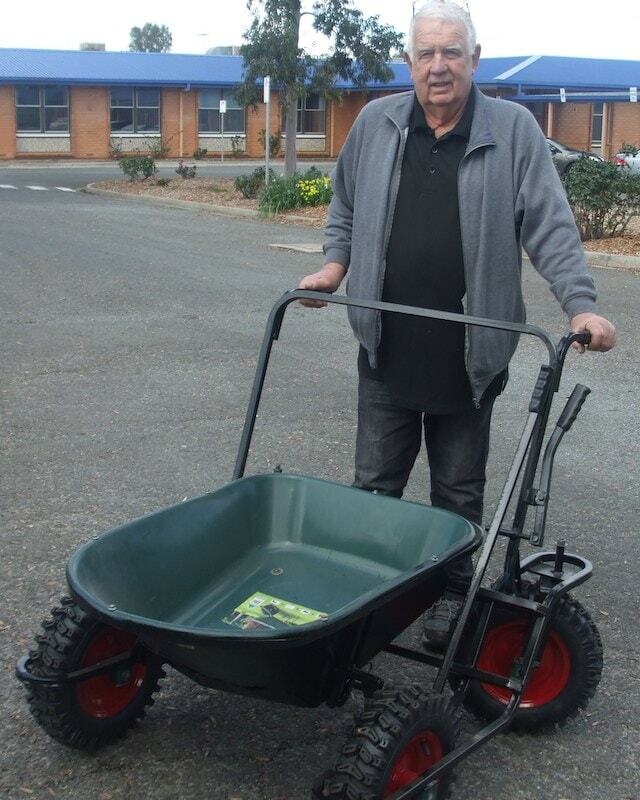 He lives on a large property on the Fleurieu Peninsula and required a very stable four wheeled, all terrain, tipping wheelbarrow. The wheelbarrow had to have handles set quite high as Peter is very tall and has difficulty bending. He would also be leaning down through these handles and relying on them to support some of his weight as he moves the barrow around so a cross section that extended between the handles similar to what you would see on a shopping trolley suited Peter’s needs. The wheels needed to be quite large in order to manage the rough terrain on Peter’s property. TADSA Volunteer John Stevens (pictured below) undertook the project. He built the frame from scratch and bought a light weight barrow tray. The finished wheelbarrow has a brake and a locking mechanism to stop the tray from tipping.